Video Poker is an extremely popular casino game played in casinos all over the world. The accessibility and convenience of playing poker on a video screen really makes it an excellent fit for casino floors. So, it is easy to see why casinos love them but what makes the games fun for players is the speed of the hands and variety of games available at your fingertips. You’ll find many different variations of video poker but generally all are played using the same rules. Players will choose their bet, and then the game deals your hand. You select which cards to keep and re-draw if necessary. Your resulting hand is displayed on the screen. The best hand on most video poker games is the Royal Flush which pays out a whopping 250 times your bet. You can find machines with various pay out structures, different themes and several twists on the game as well. 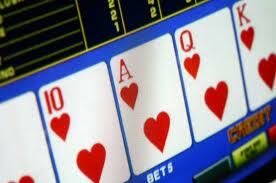 Online casinos are famous for their exciting video poker games. The high-pay outs, progressive jackpots and fun themes will keep you occupied and entertained for hours. Online casinos feature some of the best video poker games each with a unique twist setting the game apart from the rest. Ultimate Video Poker, available at Virgingames.com, offers a unique pay out for four of a kind hands with Aces or Face cards. So, instead of just a single payout for any four of a kind hand, you have the chance to score a bigger pay out for four Jacks, Queens, Kings or Aces. Four face cards lands you a whopping 40x payout, much larger than the typical 25x payout for four number cards. You’ll get an even bigger payout of 80x your bet when you land four Aces. When you hit a Royal Flush, you win 800x your bet. This game also features a turbo mode which displays card in rapid succession so you can play more hands in a shorter period of time. That can increase the number of hands you win during your play time. Other games included with Ultimate Video Poker include Deuces Wild where twos are always wild. Or, play Deuces and Joker where all the twos and two jokers are wild, and its possible to hit a five of a kind (four twos and a joker). That gives you an eye-popping payout of 2000x your bet. Play all of these games today on Ultimate Video Poker at Virgingames.com.